You are Sean Devlin, an Irish racing car driver who becomes The Saboteur on his road to revenge against the Nazis. While the visuals are painfully average and the open-world gameplay offers nothing new, you might just get find yourself sucked right in anyway with fun gun battles and the optional stealth approach. 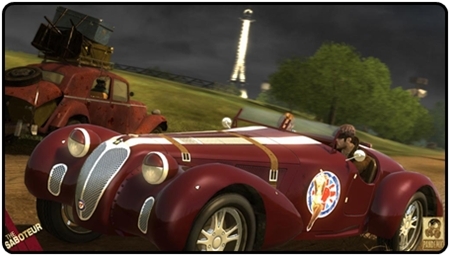 A neatly condensed Paris and its nearby countryside make up the landscape of the game. You help out members of the French resistance and British spies to help liberate Paris and send the Germans scurrying back to sausage country. 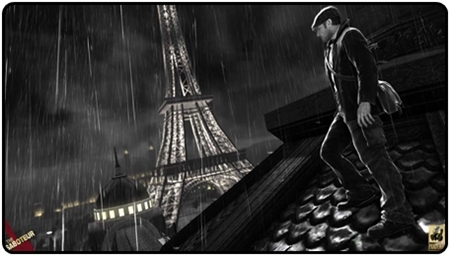 The early buzz around the game focused on the black and white visuals to signpost areas under heavy Nazi oppression, the idea being you would try and take a neighbourhood back and inspire the Parisians, bringing colour back to the world. Get to a high vantage point and you can see pockets of colour around the city. Oppressed areas appear to be in a permanent ‘rainy night’ condition. While these elements are present it seems to be merely a gimmick. Once colour does return, it’s just an aesthetic effect, with no impact made upon gameplay and the amount of Nazi’s patrols. Okami and last year’s Prince of Persia are excellent examples of how to do it properly. 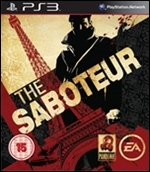 There was potential for The Saboteur to be visually unique but it ends up looking quite ordinary. The textures of the city are so bland it makes the black and white areas look even worse. Missions are standard open-world fare: bring this, blow-up that, drive here, protect her, kill him and so on. The main element that sets the game apart from the GTAs of this world is the way stealth is encouraged by stealing Nazi uniforms and seeing how deep into a mission you can get without getting caught. Nazi soldiers have a coloured glow around them and on your onscreen meter, which is particularly useful in the black and white areas. White means they don’t consider you a threat, yellow is for when they think you’re doing something suspicious like climbing a building, running, or getting too close. If the yellow meter fills up their glow turns red which is an alarm state, where they’ll call for help and try to kill you. Stealth initially feels cumbersome as your ‘suspicion’ meter rises way too fast, even when you’re in disguise. It goes up quicker when you jog, sprint and even walking past enemy soldiers puts them on edge. They’re so bloody paranoid it’s a miracle they even made it out of Germany without killing each other. When you are discovered, your disguise magically disappears putting you back in your old clothes right in the middle of an off-limits zone. It’s doubly annoying as you have to kill an enemy with melee strikes to get a uniform. A blood-soaked, bullet hole ridden jacket is a bit of a giveaway. When you do mess up, the amount of Nazi heat you’ll have on your tail works in the same manner as you wanted status in GTA4, complete with the red circled area on the map which you have to escape to lose them. This means even if you’ve been hiding unseen on a roof for five minutes in a red zone they’ll never leave. But step one foot outside the zone and even chasing cars behind you will completely forget about you. If getting to the edge is too far away you can hide in special areas like roof hatches and sheds and they’ll give up the chase. Failing that just ‘blend in’ by smooching an unsuspecting local girl. If you do get caught out it’s not game over as you can blast your way through most missions as it only takes a few bullets to drop ze Germans as this side of the game has a light arcadey feel. Once you fully grasp the stealth system available, you can start to really enjoy it and the more in-game perks you unlock the easier it gets too. Working out how to distract guards and blow up multiple targets while remaining undetected is a real thrill. The cover option was originally going to be a natural one without a ‘snap-to’ button. It was rubbish and a button for the function has been loosely thrown in last-minute. It just about works enough for purpose though thanks to the easily killed AI that lets you mow down a group in one sweeping clip. Climbing is a big part of the game. It works well enough on most buildings, if a little unresponsive at times, particularly with the way you cling to an edge when trying to get off a low wall or box while getting shot. All this is made up for when you complete a few rooftop escapes by leaping over a street between two tall buildings, miss the roof and make a last-gasp grab on a lower window-ledge. Driving around is one of the game’s strongest elements with the car handling and speeds generally ignoring the limitations of the time setting and going for squealing tires and glorious hand-brake turns. Navigation is simple to thanks to a setting-defying Sat Nav map on-screen. 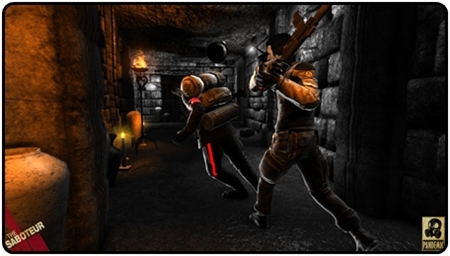 There’s no getting around many of the game’s rough edges. The accents and dialogue make a mockery of the line between awful and hamming it up for laughs. You’re never sure which it is. The short music playlist repeats too much. 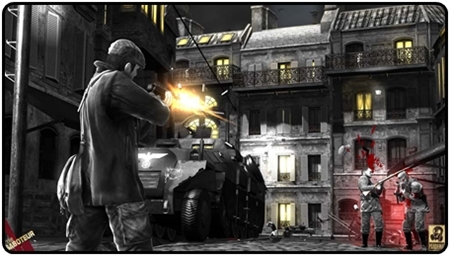 The graphics have a distinct lack of polish too, especially the buildings of Paris themselves, which are incredibly bland and look more like last-gen models. You get used to seeing the frame rate stutter occasionally, or if you’re really lucky a flying car float past. This is the game that finished off the developers Pandemic just before release. It’s a better game than their recent offerings of Mercenaries 2 and Lord of the Rings Conquest, but you can see a pattern of average releases that lead to EA shutting them down. If it only took Haze to shut down the home of Timesplitters, Free Radical (sniff), then Pandemic probably saw it coming, hence some of the half-assed parts of the game. Despite the above though, you might just get hooked into the game thanks to the Freeplay challenges. These are simple tasks, such as blowing up searchlights, sniper towers and fueling stations, or finding supply boxes. There are hundreds of these dotted around. You can even buy maps that display their locations in each area. The maps are a godsend and keep you interested as you’ll see them mid mission all the time on your corner map and they’re distracting in the best possible way. It makes them seem like an obtainable target too. 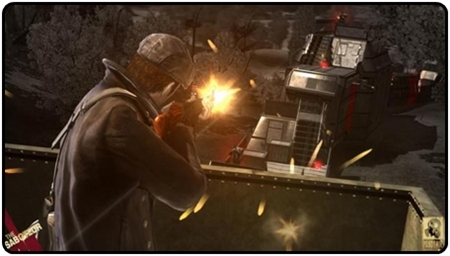 The Saboteur has unfortunately been released in Assassin’s Creed 2’s wake. AC2 is only going to last you so long though and if you can pick this up a little cheaper later on, it’ll keep you going for ages with the hundreds of Freeplay challenges. Once you’ve gotten over the fugly visuals, there is an enjoyable game here with the stealth sections sometimes coming together nicely when you’re sneaking around seeing how sly you can be. To be honest it could have been great with some extra effort from Pandemic.